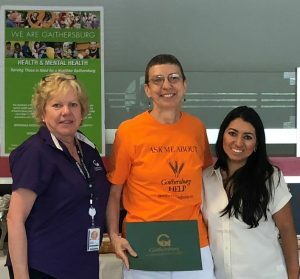 Congratulations to HELP Volunteer, Janet Neumann, for being named Nonprofit Worker of the Year by the City of Gaithersburg! Janet works tirelessly on behalf of Gaithersburg HELP, serving as the Director of Rx/Financial Programs and the UMAN Representative, while also participating in the Executive Committee, Fundraising Committee and so much more! She is a vital team member and an amazing advocate within our community. We applaud Janet for this well-deserved honor!